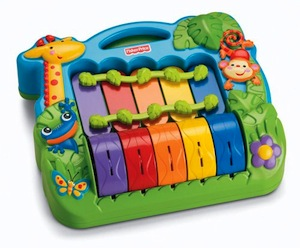 This is a rainforest-themed music-maker. Baby rolls five brightly colored wheels that make music by striking five connected keys. The rollers and keys are surrounded by plastic casing that resembles the rainforest. There is a handle at the top of the keys so that mom can take the product on the go.